I've added a new spraycan / stamp mode to the paste tool. This will be exclusive to the Pro Edition and it's meant for quickly adding detail at a higher level (for example in world maps) by using complex 'brushes' made from regular or custom tiles, etc. A good example would be if you're making a town map and have a set of custom tiles that represent a building, this will make the job of stamping multiple instances of that building easier. This will be a feature exclusive to the Pro Edition. Last edited by David Walters on Oct 10, 2016 17:46, edited 1 time in total. After seeing that stamp feature I'm reminded of Mario Paint. I'm hoping one day I'll stumble upon a secret fly swatter mini game in GC now. MrPopo wrote: After seeing that stamp feature I'm reminded of Mario Paint. I'm hoping one day I'll stumble upon a secret fly swatter mini game in GC now. 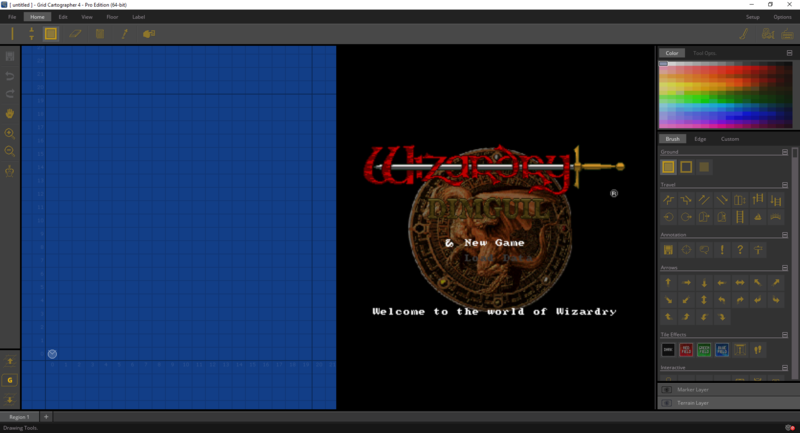 I can neither confirm not deny the existence of any mini-games in past, present or future versions of Grid Cartographer. Part of my work today was to optimise the undo system, which is a major bottleneck for performance on maps with many floors or regions. After having done this I've been able to improve the speed of the note/label system and also the cut, move and paste tools. I'm not sure if this GIF will make sense on its own. If you've used GC before though, you'll probably be happy to see it. What's happening here is I'm drawing on empty space and dragging - so its adding blocks. Then I click the start block again, this time to toggle it off. In past versions you'd need to enter into a super click-fest to remove the rest of those blocks one by one - but now the brushing code will remember you toggled something off and continue to do so for other tiles while you're dragging around. This is still in testing but it's nearly ready and will be in the next version. Hoping to have v4.0.2 out next week, if possible. When I developed Game Link 2.0 my initial target was DOSBox but I also wanted to extend it to other systems. One of the simpler ones to do this for was the original PlayStation. It's not exactly dungeon crawler city on the system but there's a few Japanese Wizardry games on there and I think it'd be cool to support playing them. Right now, as you can see, I have video working and since you use a controller to play, like audio it 'just works' (you need a pad plugin that supports working in the background but that wasn't too hard). However, as eagle eyed viewers might spot from the bottom-right of this image - there isn't any game detection or tracking. This isn't actually something a standard plug-in can handle as far as I can tell. So, today I've written to the creators of ePSXe to see whether they'd be interested in helping me by adding support for accessing disc id and RAM from a GPU plugin - this will hopefully open up the possibility to add auto-tracking to some more games. If I don't hear from them or they're not interested, I can look to other emulators like PCSX which are open source, but not quite as accurate. I'm going to hold off on releasing this plugin until I've explored getting tracking working but I wanted to share a preview of this future development. I hope you like it. I would try to get support from pcsx-reloaded. Its open source and supports more platforms. You must know that both the PSX original wizardry's had built in mapping features? One emulator that would be ideal to support is fecux for nes/famicom. There are quite a few dungeon crawlers (inc. wizardry 1-3). Pickle wrote: I would try to get support from pcsx-reloaded. Its open source and supports more platforms. Thanks, that'll be my next port of call. I decided to try and contact the ePSXe guys first though specifically because it's closed source. Don't want to ask for an API to be added and make it more complicated by telling them what names to use. I've not heard from them yet (well, technically one e-mail bounced) but I'll wait a bit longer and move onto PCSX. Pickle wrote: You must know that both the PSX original wizardry's had built in mapping features? In the context of GC4.0 it's definitely just a 'nice to have' and much less useful than Game Link for DOS games, however I hope to add things like a journal to GC one day and that would begin to improve its usefulness. Pickle wrote: One emulator that would be ideal to support is fecux for nes/famicom. There are quite a few dungeon crawlers (inc. wizardry 1-3). I've updated the 'Start Mapping' menu to, when a Game Link title is detected, include an extra button to let you make a compatible map. Rather than the tiny little status bar icon you have to click on right now which it pretty unfriendly. I'm just working on making the Ctrl+N shortcut do the same thing.